Watching the 2014 Winter Olympics has a new meaning for me after competing in the 2012 London Games. I have a new respect, outlook, and appreciation for the athletes. In order to be successful, athletes must not only be excellent once every four years, but also excellent every day for four years. Athletes make daily investments with the focus on a one day event sometimes four years away. These athletes train for years for one event, and many of the competitions or races finish in less than a minute. The training in cold, wet, miserable conditions when your body can barely get out of bed, time spent away from home, missing holidays and valuable time with close friends and family is all invested for a single event that happens once every four years. Every athlete has come to the Games as prepared as they can be and ready to thank their support groups through performance. Watching the Olympics with my new outlook has caused me to relate to and feel for every athlete: the one who succeeds, and the one who makes a millisecond mistake that costs him or her the race. I have a new appreciation for the profile stories about the athletes. I love learning about who the person is behind the ‘athlete.’ But I also understand the time and energy athletes put into interviews. Interviews are one way for athletes to communication with the public however, if an athlete is in a spotlight, numerous interviews may be requested. Phone interviews can take five to sixty minutes, email interviews can take an hour, and TV or filmed interviews can take eight hours. Often an athlete is asked the same question they have been asked in other interviews, but must respond like it’s the first time they’ve been asked. It’s not always easy, but it’s one small way athletes can give back to the public. I am thankful for triathlon after watching some of the Winter Olympic sports. I’m thankful I don’t have to wait for a score after I compete; instead, I cross the finish line and know where I stand. I would be anxious waiting for someone else to judge my race. I also love triathlon as I have three different disciplines, and you never know what may happen. Each race is different, and each athlete has to be prepared for any race situation. 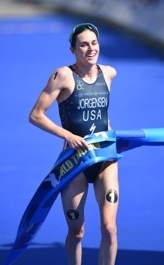 My coach, Jamie Turner, is helping to prepare me for any triathlon situation: we must be strong enough in the water to swim in the front pack, responsive to spikes in power on the bike in case a domestique or strong rider starts to control the race, and able to run faster than anyone else once off the bike. Every day of training is a challenge and an education. This year is easier than last year in the sense that nothing is new. But this doesn’t mean the daily grind gets any easier. At this time of the year, many triathletes are in a building and base phase of training. Every day our bodies and minds are tested under fatigue. When struggling, I look to the USOC motto (It’s Not Every Four Years, It’s Every Day) to gain composure and focus on creating excellence in everything I do. I know when the big race comes practicing under fatigue and pressure will have been good preparation. While watching the Olympics I became eager to race. Thankfully my first race of the season is fast approaching. I will race the World Cup Triathlon in Mooloolaba, Australia on March 15th. Flashback to London Olympics. Spending time with my family.